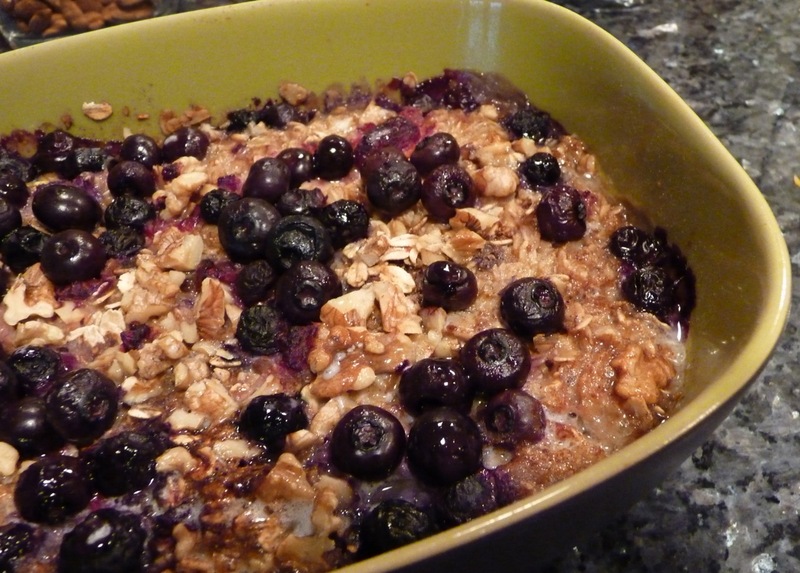 Baked oatmeal is one of my favorite breakfast dishes to make because it reheats so well. There are just two of us in the house, and we usually don’t eat breakfast at the same time, so having something ready to warm up comes in handy. A while back, I got a copy of Heidi Swanson’s Super Natural Every Day from the library, and I flagged her version of baked oatmeal right away. It’s got bananas on the bottom, berries on the bottom and top, and walnuts mixed in and sprinkled on top. So many flavors and textures, and it all adds up to a delicious, hearty breakfast. I made this recipe along with my blogging friend Michele. 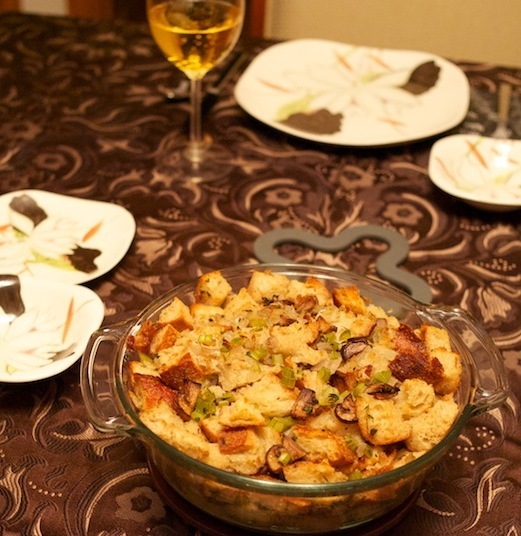 Be sure to check in with her blog, Veggie Num Nums, to see how hers turned out! The recipe, which appears here on Williams-Sonoma’s site, is almost the same as the one in the book. 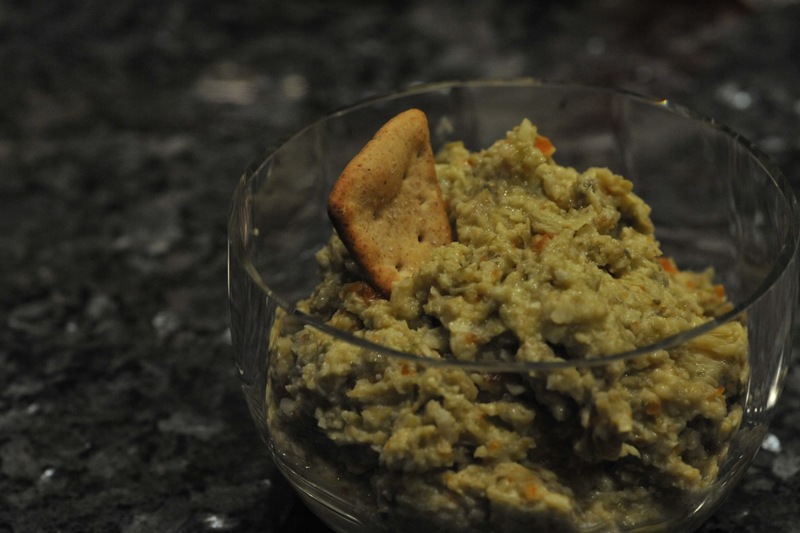 The recipe in the book provides an option of using 1/3 cup natural cane sugar (such as Sugar in the Raw), added to the oat mixture, instead of the maple syrup. I’m not a big maple person, so I opted for the sugar. When I scooped it out of the baking dish, I noticed that there was some extra liquid on the bottom, even though the oatmeal was cooked through. I think using frozen berries might have caused this. It wasn’t a big deal, but next time I’ll thaw and drain them first. My husband, not a nut fan, declared this good, but “too nutty.” I think it would work out fine to leave the nuts out and serve them on the side for sprinkling on individual portions. More nuts for me! Lemon-Zested Bulgur Wheat: This is another great hot cereal that reheats well. Chickpea Wraps: This was a welcome change from the usual sandwich selections. I used pita bread instead of a tortilla or wrap. Cabbage-Chickpea-Curry Soup: Tons of curry flavor; perfect for chilly weather. This sandwich topping combines so many things that I love: roasted red peppers, fresh and sundried tomatoes, plus olives and pickles. It’s my adaptation of a Jamie Oliver recipe for Stuffed Focaccia – in that recipe, a focaccia loaf is heated, split horizontally, and filled with a version of this topping. It’s delicious served that way, but also works well on other types of bread (I put it on some naan in the photo above), and tastes great as part of a more traditional sandwich, with sliced ham, turkey, and/or cheese. It would also be a welcome addition to a green salad. I should probably call this Trader Joe’s sandwich topping, because many of the ingredients are things I stock up on there – all of the jarred items in the ingredients list are things I buy there. I got hooked on the cornichons a while ago and haven’t tired of them yet. As much as I love dill pickles, those tiny, sour pickles are addictive! Roughly chop first 7 ingredients (roasted red peppers through cornichons) and put in a medium bowl. Remove leaves from parsley and roughly chop; add to bowl. Add hot pepper, if using. Stir in lemon juice and olive oil. Store covered in refrigerator. 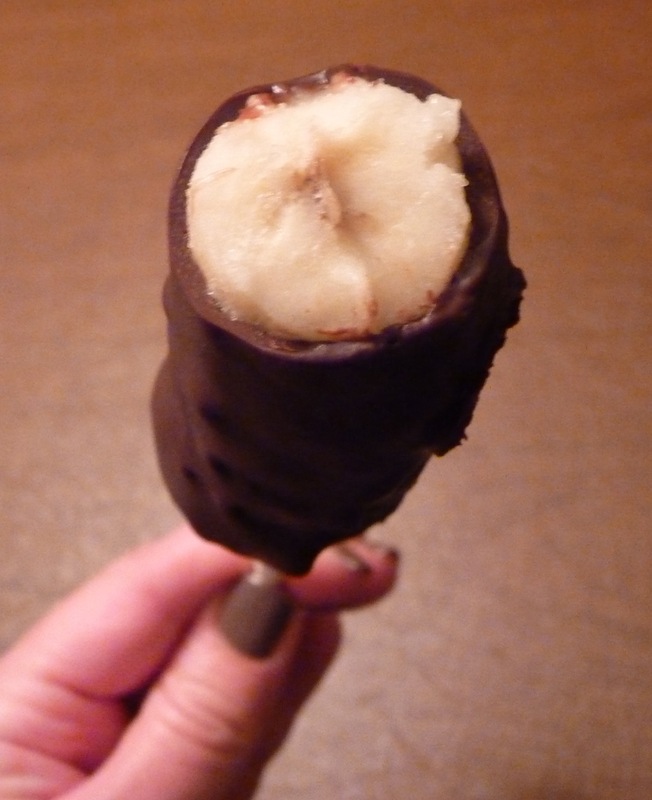 Remove from refrigerator about 30 minutes before serving to take the chill off. 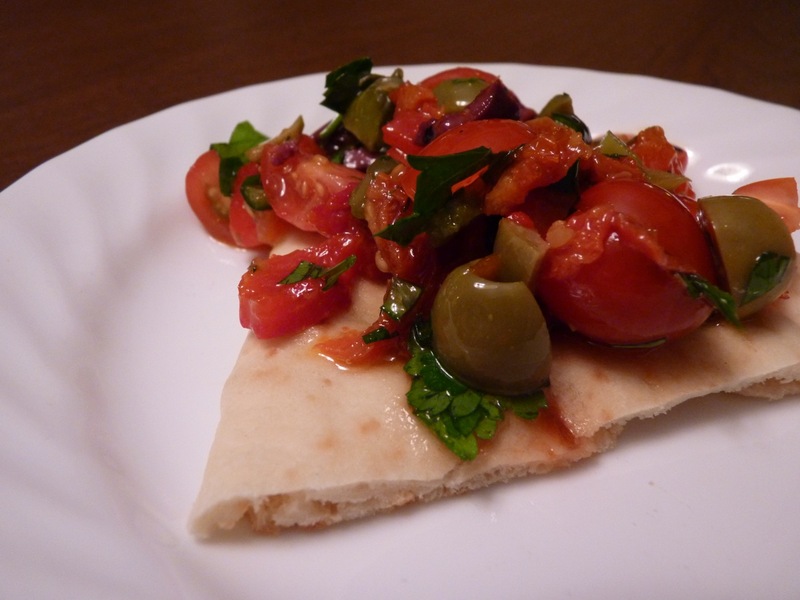 Serve on focaccia or as part of a sandwich. Tastes great with Parmesan grated on top. 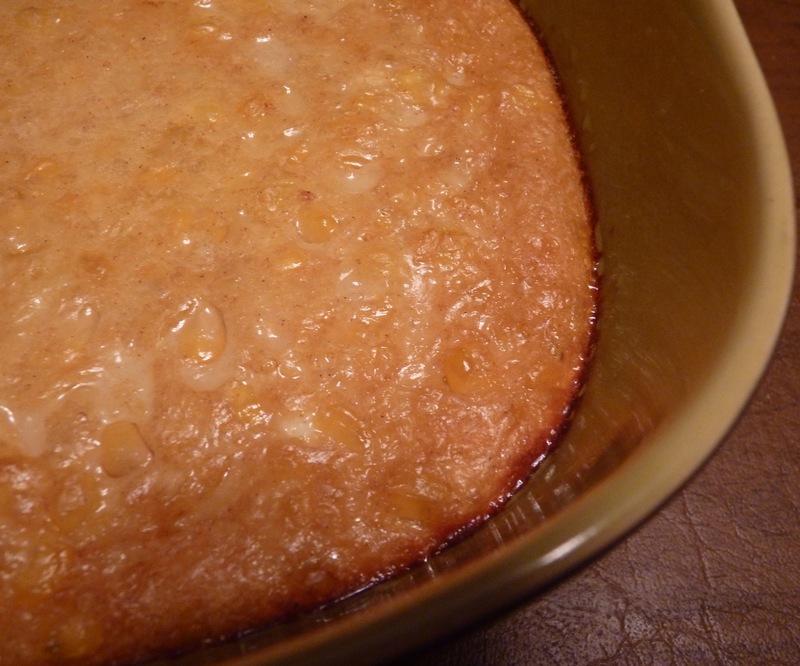 This dish is a little sweet, a little bourbon-y, and full of corn goodness. Last year I made it for Thanksgiving instead of my family’s usual corn dish, and it went over really well. I made a double-batch to ensure that I had leftovers; it’s just as good reheated in the microwave the next day. Spray an 8″ square baking dish with cooking spray. In a small bowl, mix the cornstarch and bourbon. In a large bowl, whisk the eggs and milk until combined. Whisk in the cornstarch and bourbon mixture. Add the rest of the ingredients and stir with a spoon. Pour into prepared baking dish. Bake 45-48 minutes or until lightly browned and no longer jiggly in the center. Serve warm. Note: I usually have to bake it longer, especially if making a double-batch.